Newark’s second-oldest Episcopal parish, founded in 1837, today is marking the 150th anniversary of the completion of its brownstone edifice at Broad and Walnut streets, opposite the Peter W. Rodino Federal Building. The architect of the handsome stone building, known for its bell tower, was the famous architect Richard Upjohn, a master of Gothic styles. 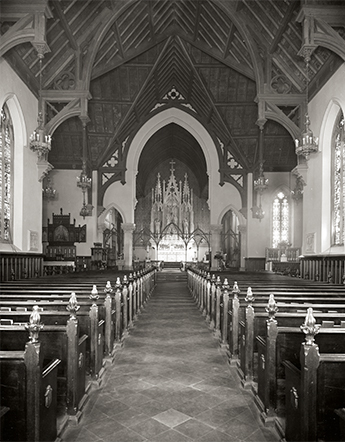 Since the 19th century, Grace Church has been noted for its choral music and Anglo-Catholic worship. In 1882, Grace’s choirmaster, Samuel Augustus Ward, composed a hymn that became the melody for 'America the Beautiful.' In 1972, nearly a century later, it was listed on the National Register of Historic Places. In 1988, it was designated a National Historic Landmark. A plaque above the front door installed by the Newark Landmarks and Preservation Committee contains the above information, probably enough for the average passerby. Grace Church, however, means considerably more than this 100-word inscription. In addition to its place in religious circles, it has been part of the city’s architectural, artistic, musical and social history since the parish’s founding in 1837, a time in history that marked Newark’s transformation from a rural township to a bustling metropolis. The site where the church was built originally was the home of Thomas Johnson, one of the New Haven settlers who helped found Newark in 1666. In 17th century terms, Johnson was politically prominent, serving as the township’s first constable and entrusted by the town fathers to operate its first tavern and inn. It was on this spot that his home once stood. Johnson also was involved with Robert Treat in negotiations over the placement of the Newark-Elizabethtown line. By 1810, Newark-born Gov. William S. Pennington, who lived on South Broad Street, acquired the site and gave it to the city and county with the understanding that it be used as a public courthouse. Built in 1811, the Essex County Court House and Jail was destroyed by fire on Aug. 15, 1835. The establishment of the Grace Church parish can be traced back to Trinity Church (Trinity-St. Philip’s Cathedral), founded in 1742. In the mid-1830s, Newark Bishop George Washington Doane wanted to create an Anglo-Catholic parish in the Newark Diocese. Grace is the city’s third-oldest church, following Old First and Trinity, and the city’s second oldest Episcopal parish. When Bishop Doane sent a letter to the Rev. George T. Chapman, a young Boston clergyman, inviting him to Grace as its rector, Doane described the town by saying Chapman would find Newark to be 'one of the most remarkable places in the world, a place without parallel in this country for growth in population and in wealth; they (the Newarkers) are among the most enterprising of the race, great money-getters, and once they are interested, great money-givers.' With the arrival of a rector, two wardens and a vestry, the new church was ready to function with the Rev. Dr. Chapman, Luke Reed, and Charles M. King as senior and junior wardens. There were also several local vestrymen, including Eliza E. Boudinot, Joel and Daniel Condit and Jeremiah C. Garwaith. Garwaith became one of the church’s most adamant supporters. Grace’s founding occurred because Newark Episcopalians were growing in numbers and because of a popular movement in the Church of England, referred to as the Oxford Movement. Started in 1833 by Anglican clergymen at Oriel College of Oxford University, the movement marked an attempt to revamp the Church of England by restoring many medieval or (Roman Catholic) religious traditions. Its hallmark was the use of beautiful medieval architecture and interior decoration, rich vestments and fine church music, including Gregorian chants. ‘‘The Oxford Movement has exerted a great influence, doctrinally, spiritually and liturgically, not only to the Church of England, but also throughout the Anglican Communion,' said one writer. By the end of the 19th century, Newark’s Episcopalians/Anglicans worshiped not only in a Broad Street colonial church that became Trinity Cathedral, but also in two Anglo-Catholic parishes—House of Prayer along the north of Broad Street and Grace Church to the south. The era into which Grace Church was born in 1837 was both a boom and bust. But once construction of a church building was under way, there was no way that heaven or earth could stop it. Early services for the parish were held in a building at Broad and Mechanic streets. Later, a small hall was secured on Beaver Street. Finally, a 42-foot lot was acquired on Market Street between Broad and Mulberry streets for about $3,500, and a church home was secured. By 1847, the site of the old county court house and jail was acquired. Later that year, the vestry contacted Upjohn to draw plans for the present building. At the time, Upjohn had just completed his design for New York’s famous Trinity Church on Wall Street in New York City. Upjohn’s career was long and productive. The Daily Advertiser described him as one of America’s finest architects—a sincere High Church Episcopalian and follower of Augustus Welby Pugin’s belief in the authenticity of Gothic design for Anglo-Catholic parishes. Born in England and trained as a cabinet maker, Upjohn came to America in 1829. He settled in Bedford, Mass., as an architectural draftsman and later moved to Boston, where he opened his own business. After completing his Wall Street masterpiece, Upjohn moved to Newark to produce Grace Church at Broad and Walnut streets. The church building is a cruciform, or cross shaped, with a 64-foot long nave and 34-foot wide transepts to the north and south. The chancel is 22 feet deep, giving the building a length of 120 feet. The spread across the transept from north to south is 67 feet, and the sanctuary is designed to hold 131 pews. The contract for the carpentry work went to Gould and Moore for $8,600 and the masonry work went to William S. B. Clark for $11,450. The architect’s fee was only $1,000—a small price for such a great product. The exterior of the building is rusticated from fitted stone work from nearby quarries. A tower and spire of 150 feet, once topped by a golden cross at its peak, is a south Broad Street landmark. The broad spire has four short louvered windows at its base. On the interior, a massive set of organ pipes cover the lower part of the lancet windows in the gable wall. The sharply pitched roof is framed by the bell tower and a large tri-partite window occupies the area above the front entrance porch. Large openings of Gothic shaped windows pierce the nave, transepts, and choir of the sanctuary. The interior of the church is dominated by the high altar and reredos sculpted of Caen stone, built in 1892 to replace a simpler wooden altar. It rises 45 feet above the nave floor. Flanking the reredos is a polychrome William Morris-type green and gold backdrop, and the ceiling overhead is dominated by the passion flowers and symbols of the Holy Apostles. St. Mary’s Altar, on the Gospel side of the church (to the left of the altar when facing front), dates from 1945. It includes a triptych depicting scenes from the Virgin’s life and is topped by a wooden statue of the Virgin and the Child. On the Epistle side of the altar is the Altar of the Blessed Sacrament, dating also from 1945. It is wooden, decorated with gold leaf and polychrome. The organ was built in 1930 and is located in the front choir area below three sets of lancet glass windows in which vibrant shades of reds and blues dominate. Among these windows is the one dedicated to longtime church rector Charles Gomph, and commemorates the lives of the Venerable Bede and St. Dunstan. The former was a great Anglo-Saxon churchman and the latter was an archbishop of Canterbury. Two great groups of windows dominate the church’s north and south transepts. On the north side is the Te Deum windows, better known as the Raymond Memorial for former Newark Mayor and Grace Church Senior Warden Thomas Lynch Raymond. The subject consists of groups of many individuals praising God. They are portrayed in cascading pastel colors regulated by sensitive refinement. Across the transept is a three-part stained glass masterpiece, dedicated to the ninth rector, Dr. George Martin Christian and donated by the Kinney family, whose members married into the city’s socially prominent Frelinghuysen, Condit and Burnet families. This window is in deep solid brooding colors, filled with passion and commitment. The latter group is dedicated to the defense of the Faith by St. Anthanasias and St. Thomas Aquinas. In the national historical nomination, it was described as 'among the finest examples of English ecclesiastical stained glass in the United States.' Equally important in the nave are the great English Eastlake windows, also highly prized by experts who are familiar with their rich browns, reds, and muted yellows. How proud those early parishioners must have been to leave their temporary wooden chapel on Market Street for their new brownstone home at Broad and Walnut streets. The historic procession was led by the Mexican War hero, Gen. Winfield Scott, altar boys and clergy carrying crosses, candles and censers. Many Newarkers, it was reported, had never seen such 'carryings on.' In 1937, a centennial celebration was held by the church under the direction of the longtime rector, Rev. Gomph. By that time, the church had opened a new parish hall, provided hot meals for undernourished children during the depths of the Depression, reduced its mortgage, and paid off some of its short-term bank loans. As part of the celebration, the Howell family presented to the church their stations of the cross in memory of their son, Robert Gilbert Gilchrist Howell, and installed the great 90 rank Hampton Memorial four manual organ. The musical tradition of Grace Church has been well known and nourished almost from its beginning. A choir of men and boys has been a tradition since 1850. The years also have been marked by the installation of a major pipe organ in the church and the presence of the highly respected organists, choirmasters and music composers. Edward Hodges, an English musician, had a tremendous influence on Anglican choral music. He was briefly associated with Grace Church through his son and daughter, a church organist. The elder Hodges was born in England. Interested in Anglican church life and music, he was at one time closely associated with Trinity Church on Wall Street in New York, where he and an assistant started a choir of men and boys. Following a series of strokes Hodges retired from his position in New York and came to Newark to live with his son and daughter. Although here for only a short time before he returned to England, his influence on Grace’s musical tradition has been lasting. From his day until now, Grace Church has had a strong men and boys’ choir, one of the few left in the country. This kind of choir was further supported by the church’s sixth rector, the Rev. John Sebastian Bach Hodges. In 1882, Samuel Augustus Ward, then organist and choirmaster, composed the setting for the hymn 'O Mother dear Jerusalem.' The tune, 'Materna America the Beautiful, ' emerged as the country’s most patriotic hymn, considered as American as apple pie, the flag and Mother. The pipe organs at Grace include the Hall and LaBaugh organ, once located in the north gallery, and the great Hampton organ, a 90 rank organ with three manual organs in the chancel and a four-manual instrument. Both are playable from one console. In the late 1980s, this instrument was replaced by the great Casavant Organ, built by a Canadian organ company. It truly is one of the great concert organs of Newark and its vicinity. Described as eclectic, it was capable of playing much of the literature of the classical, baroque, French-style romantic and modern romantic organ literature. It is a tracker action instrument, which means that it has a mechanical linkage to the air valves as opposed to an electronic action system. As the church now celebrates the 150th anniversary of the completion of its Broad Street building, parishioners are taking time out to note its historic heritage—how it has been innovative in its liturgy and how it has contributed to the musical heritage of the Episcopal Church. Minton tiles, Eastlake windows, 'America the Beautiful, ' Richard Upjohn, black walnut wainscoting, early tavern owner Thomas Johnson, the Raymond Te Deum window, the soaring voices of one of the nation’s oldest choirs of men and boys, flickering candles, polished silver communion cups, ironed linen napkins, a little tray of tea sandwiches after Mass, all contribute to keeping this twinkling jewel of Broad Street alive. True to its promise to provide an Anglo-Catholic home for Episcopalians and Anglicans, the liturgy, architecture and music heritage of Grace Church are alive and well at Walnut and Broad streets.